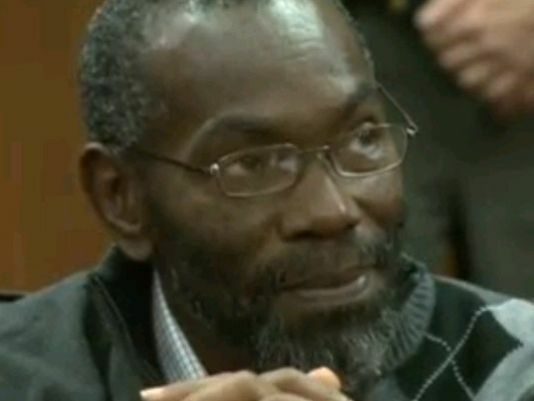 Ricky Jackson has been freed after 39 years in prison after a witness said he lied as a boy. The 57-year-old man, who was imprisoned at the age of 18, came to Cincinnati on November 25 to thank the law project that worked to win his freedom. The Ohio Innocence Project usually works to free people using DNA evidence but took Ricky Jackson’s case despite the lack of DNA. Project staff attorney Brian Howe said before Ricky Jackson’s remarks that they had seen many weaknesses in the case against Jackson, and they were skeptical of the witness’ testimony before he told his pastor and then authorities that he had lied. Ricky Jackson was released from prison on November 21 after a judge in Cleveland dismissed the cases against him and Wiley Bridgeman, 60. Witness Eddie Vernon, who was 12 years old at the time of the slaying, recanted last year and said Cleveland police coerced him into testifying that the two men and another man killed Cleveland businessman Harry Franks in 1975. Ricky Jackson was imprisoned for 39 years, serving a life sentence for aggravated murder and other charges. Cuyahoga County Prosecutor Timothy McGinty has said the case fell apart after witness Eddie Vernon recanted his testimony. Eddie Vernon said he kept quiet because investigators threatened to imprison his parents. Ricky Jackson said that he did hate Eddie Vernon at first, but later realized he was just a child. He says he would like to meet with Vernon in private to tell him he forgives him and to thank him. A fund set up by the Ohio Innocence Project to help Ricky Jackson as he tries to readjust to life outside prison has already raised almost $43,000, project Director Mark Godsey said.